The name and the cover of this book were not appealing to me. I did, however, think that the dark synopsis was original, therefore intriguing. I did not want to be lame and judge a book by its cover, so I started reading it. “I finished this book a few days ago, and I have carried it with me since then, trying to talk myself into it. This book glorifies and romanticizes self-harm, to the point where it is actually the means through which the protagonist actualizes her goal. None of her friends call her on this, and her lies to her mother are never addressed. Many reviewers had similar comments, and I have to say that I wholeheartedly disagree with their perspective. The author NEVER glorifies the act of self-harm. She does, however, not resolve the issue or go on to talk about it in any meaningful way either. While the self-harming behavior of the MC is what gets the ball rolling on the main storyline–a complicated relationship between two people-it does not define the MC, Tori Burns. Her resilience defines her, and I think that’s one of the points of the novel. The author presents a complex and realistic female protagonist, someone we could possible have grown up with, worked with, or had as a neighbor, and shows the reader how this person, who has suffered trauma, deals with such a dark secret–hidden in plain sight. The author gives a realistic view into the normal-yet-not-so-normal life of a teenage girl whose had to change her life to keep her cutting hidden from her family and her friends. I think the author handled this topic in a beautiful and nuanced way. It is not the author’s job to preach at readers about the dangers of self-harm. The fact is, there are people all around us that struggle with this and, if anything, The Suffering tree teaches readers how to recognize the signs of someone who is suffering with anxiety, depression, or self-harming impulses. The exploration of indentured servitude alongside slavery in the early American colonies was fascinating and presented in all of its sadness and brutality. The novel jumps back and forth between the colonial times of Nathaniel Bishop, the male protagonist, and the present life of Tori Burns. The author does a great job of melding these storylines together, while exploring cultural and mental health issues. All of the characters were well fleshed out and interesting in their own ways. The novel kept me intrigued until the end, and presented some history in a very creative and original way. The romantic aspects of the story were equally original, while being reminiscent of Edward and Bella from Twilight if that makes any sense….(LOLz). Realistic, tense, sad, clever, and haunting, this book marks one of my favorites of the year so far. I highly recommend it. 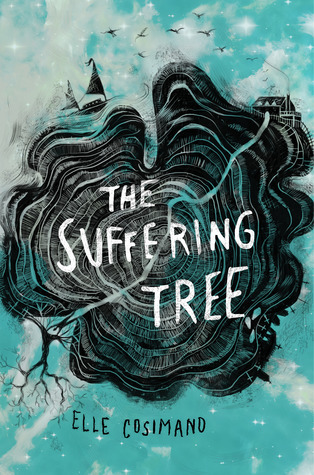 Have you read The Suffering Tree? Did you find it offensive or in bad taste? Or did you love it? I would love to hear your thoughts in the comment section. Elle Cosimano is the award-winning author of the acclaimed young adult novels Nearly Gone, Nearly Found, Holding Smoke, and The Suffering Tree. Elle grew up in the Washington, DC suburbs, the daughter of a maximum security prison warden and an elementary school teacher who rode a Harley. A failed student of the hard sciences, she discovered her true calling in social and behavioral studies while majoring in psychology at St. Mary’ s College of Maryland. Fifteen years later, Elle set aside a successful real-estate career to pursue writing. She lives with her husband and two sons in Northern Virginia, Florida, and Mexico. Ughh, I super need to read this book! Fantastic review, and I’m glad you loved it! I’ve been wanting to get a copy of this book for a while, but I haven’t read any reviews on it so far. Books that talk about self harm aren’t the worst thing in the world, but when they glorify it and make it seem like it’s no big deal or it’s a great thing, I can see where problems arise. Books that talk about self harm are triggering for me as someone who had dealt with it personally years ago, so I tend to try to avoid them, unless they are important and talk about how one can help themselves. I loved reading your review – thank you for sharing your thoughts. Kelly @ Here’s to Happy Endings recently posted…Blog Tour: My New Crush Gave to Me by Shani Petroff – Spotlight and Giveaway!